The Pointing Control System (PCS) aligns Hubble so that the telescope points to and remains locked on a target. The PCS is designed for stable pointing to within .01 arcsec and is capable of holding a target for up to 24 hours while Hubble continues to orbit the Earth at 17,500 mph. If the telescope were in Los Angeles, it could hold a beam of light on a dime in San Francisco without the beam straying from the coin's diameter. 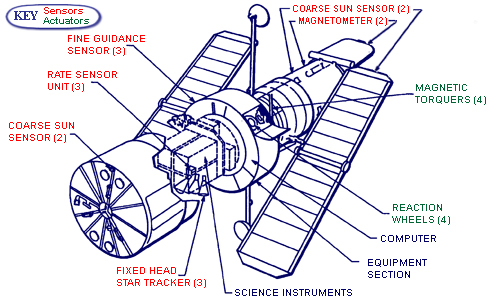 Hubble employs a variety of sensors to detect its own orientation and position. All work in tandem to send the correct information to the actuators to adjust Hubble's position on command. These sensors are locked onto two guide stars to keep Hubble in the same relative position of these stars. Measure Hubble's orientation to the sun. Also assist in deciding when to open and close the aperture door. Measures Hubble's orientation relative to Earth's magnetic field. Each RSU contains two gyroscopes, used for maintaining stable pointing. An electro-optical detector that maps areas of the sky to determine Hubble's orientation in space. Receiving information from the sensors, the actuators physically adjust Hubble's position and orientation so that Hubble can view the required celestial bodies. The reaction wheels work by rotating a large flywheel up to 3000 rpm or braking it. The resulting changes in angular momentum serve to move the telescope from one target to another. The torquers are used primarily to manage reaction wheel speed. Reacting against Earth's magnetic field, the torquers reduce the reaction wheel speed, thus managing angular momentum.